The single button key fob transmitter can fire the trap 75+ yards away allowing you freedom to get away from the machine to throw across water or incoming shots. Complete and ready to use. Just plug it into your trap, clip to trap's 12-volt battery and you're ready to go. 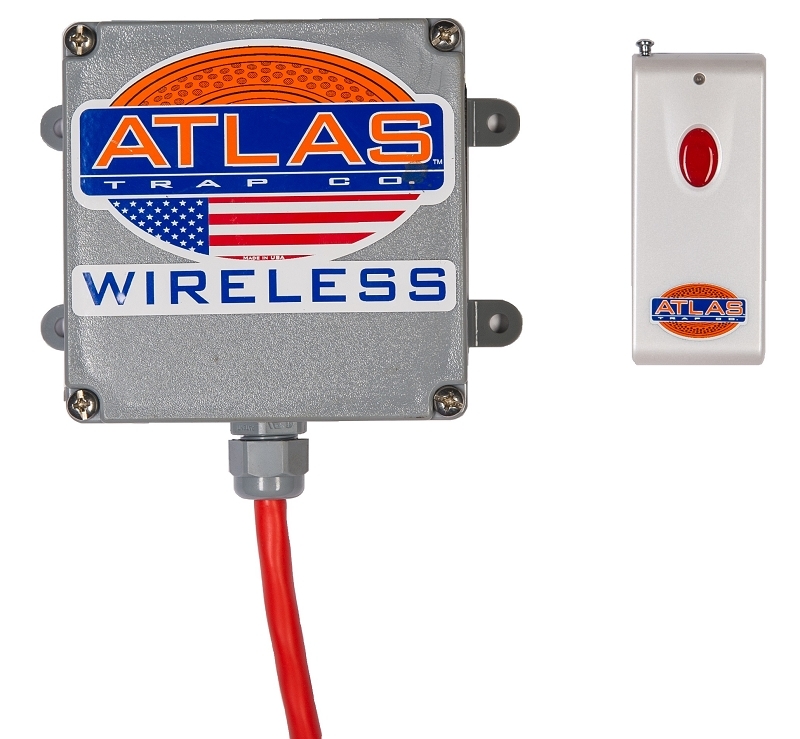 The wireless receiver is mounted in a NEMA water-resistant case. It works. Nice not to have cord to drag around. Wish remote had a way to attach a lanyard. I am so glad that I purchased this! It totally eliminates the fall risk that a cord can create. At 68 I am not as steady on my feet as I was even 10 yrs ago. Another plus is the convenience of not having to pack and stow a cord. The unit has proven to be completely reliable. Safety, convenience and reliability in one package is hard to beat. Decided to go ahead and order the remote when I ordered my ATA-50 and was glad I did. Like everyone else says, it gives you the versatility to move around wherever you want. Well worth the money. It's not an expense to own fine equipment from Atlas, it's an investment, in my opinion. I will definitely keep purchasing my clay equipment from Atlas. Scott is one of the best people I have ever dealt with in purchasing anything and that means a lot to me. When I received the machine it had been damaged in transit. Atlas quickly replaced the damaged part and their customer sertvice representatives were extremely nice and helpful. The machine was easy to set up and targets were launched consistently within a couple of feet of each other.Looking forward to lots of fun with this machine. Atlas has INCREDIBLE customer service. I read reviews and that was why I went with them. Definitely was not disappointed. Purchased first Patriot through a retailed and it arrived damaged. Mike walked me through fixing it enough to use for the weekend and then had another one made for me and they handled all of the shipping cost. When they sent the second one I went ahead and ordered the remote. Wow great investment. My son sits up on the driveway about 60 yards away and just presses the button. We can set it up in the field and walk to different angles rather than move the machine around. I would consider this a must have when making the purchase.....and I will always go back to atlas for my next purchase based on quality and especially customer service! This is a great little device to allow you to shoot alone, or on a pattern that puts you out of cable reach. I highly recommend it. Great device, works as advertised. Makes it very easy for multiple shooters to swap control of the machine and vary distance/angle of approach.